One of the main reasons I'm not posting much from Mexico City is because an overwhelming majority of my photos are unusable. Not that I'm more than a halfway decent photographer at best, even when I have a working camera - I seem to be barely capable of holding a camera without tilting it, for some reason. But, lately, my camera seems to be barely capable of taking a photo on its automatic setting that isn't blurred. So, basically, my photos are pretty much screwed. And that is the major focus of this blog. However, that is not the whole story. I am also a really bad tourist. I love walking around and looking at whatever location I happen to be visiting. I also actually enjoy some museums quite a bit. But, here in Mexico City, I'm hindered by not understanding the language. Unlike other countries I've visited, there are no English translations for the exhibits. So while I am entranced by what I'm looking at, I don't really know what it is. I still enjoy it, but I miss a lot. A whole lot, apparently. For instance, take the National Palace. I knew it was a government building, housing official offices for some of the departments. There is a balcony where the President appears to give speeches, similar to the Pope at the Vatican. It takes up one whole side of the main square, which I am always walking through because it is right near where I'm staying. So I see it all the time, and I finally got around to going inside. I absolutely adored lingering over the architecture, it's gorgeous. I particularly loved the frosted glass trim over the courtyard. ...and in the exhibition rooms. Even in the bathroom, there was a lovely frosted etched glass window. ...except that a lot of it was from Benito Juarez, who was a liberal Mexican president for the last 15 years of his life in the late 1800s and resisted a French invasion that was supported by Mexican conservatives. And if there is anything more mind-boggling than the idea of France owning Mexico, I'm not sure what it could be. I really, really wish I could have understood more of what was on exhibit in the National Palace. Still, it was a perfectly enjoyable place to while away an hour or so, and I'm glad I went. In fact, I will almost certainly go back, because it seemed I somehow missed a fairly important segment of it. first things it mentions is that there are huge murals by Diego Rivera in the stairwell. There are even photos of them. Yet, though I definitely hit a couple of stairwells.. Neither was remotely like the photos, or had murals. So it definitely seems as though a second round is in order. Which is not a problem, since it's free. But, really, you should read the Wikipedia article. 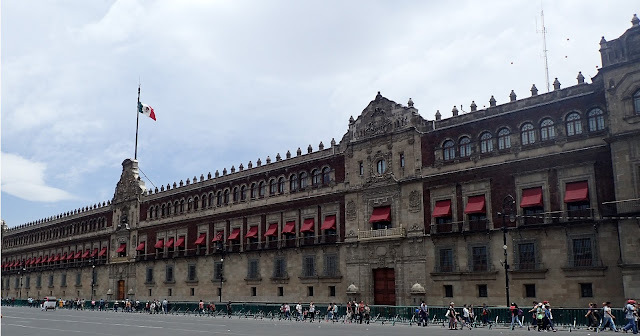 The National Palace has a very interesting history, parts of it go back to the Aztecs. But you aren't going to find out that kind of detail from me, because I obviously don't know what the hell I'm doing and can barely get a decent picture of what's right in front of me. Still, I just realized that Cinco de Mayo is this week, so hopefully I will manage to get at least a few photos that won't make your eyes want to jump out of their sockets. Anyway, I still like it here a lot, and it's ridiculously cheap, so I will probably be here a while longer. Though the photos aren't great, you may want to click on them to see more detail in the larger sizes. An ideal place where visit worth a try.